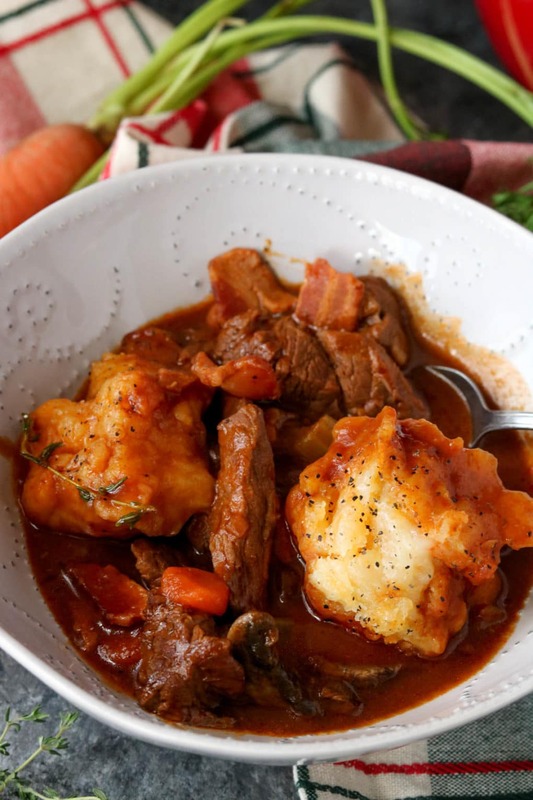 This Guinness beef stew with gluten-free garlic cheddar dumplings is THE perfect answer to a cold, dreary day. I know that’s quite a title for this recipe, but I wanted to capture the full essence of the flavors going on here. 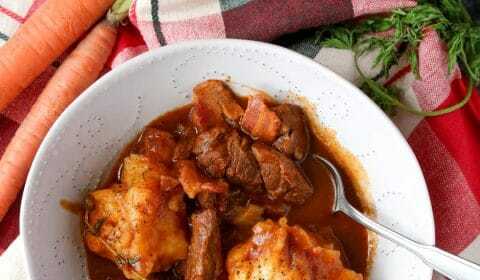 Traditional beef stews can be rather boring, but not this Guinness beef stew, especially with the gluten-free garlic cheddar dumplings. Your house will smell amazing as this simmers on the stove. For the garlic cheddar dumplings I used my favorite go-to gluten-free flour, Cup4Cup’s Multipurpose Gluten-free flour. Remember those garlic cheddar biscuits you could get at Red Lobster? It’s been years since I’ve eaten there but I still remember those biscuits because they were so good! These were another favorite I wanted to re-create into a gluten-free version. 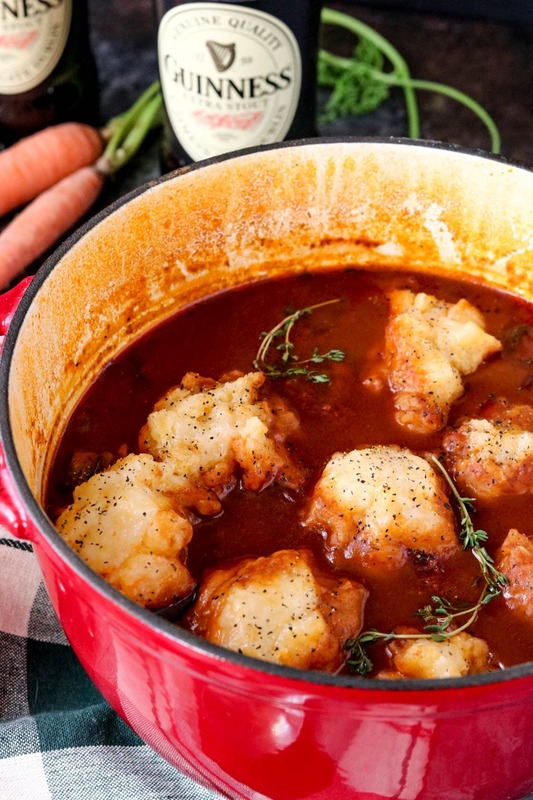 The garlic cheddar dumplings in this beef stew were a nod to those famed garlic cheddar biscuits of the past. 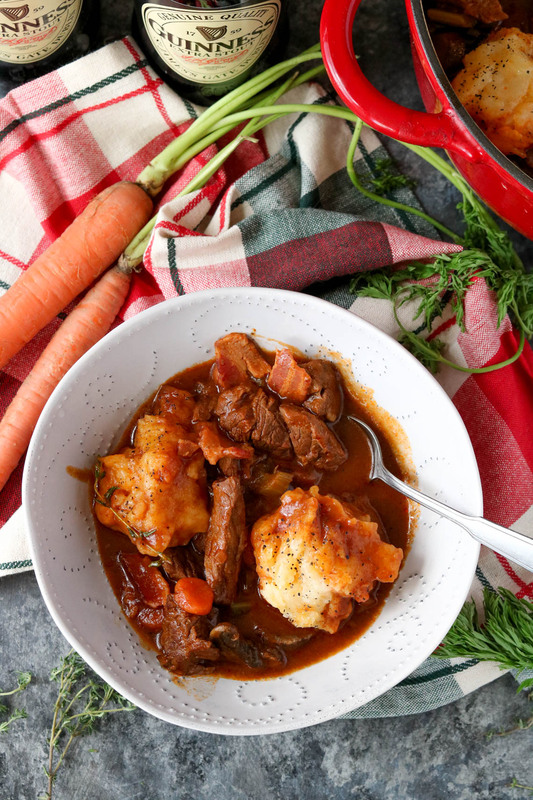 Let’s talk about the ingredients included in this Guinness beef stew with gluten-free garlic cheddar dumplings. Bacon, beef stew meat, ghee, onions, celery, carrots, portobello mushrooms, garlic, Guinness and then of course the gluten-free garlic cheddar dumplings. Can you imagine the flavors? Imagine how savory this stew is? But don’t just leave it to your imagination, add this to your menu for the week and enjoy the flavors FOR REAL! In a large skillet, cook the bacon until crisp. Remove from skillet and set aside, leaving the bacon grease in the skillet. Once cooled, crumble bacon for later use. Using the same skillet with the bacon grease, season the beef stew meat with salt and pepper then brown on both sides. Remove from skillet and set aside. In a large dutch oven, melt the ghee over medium heat and add in the minced garlic. Sauté for a couple of minutes, then add in the onion, celery, and carrots. Cook until vegetables become soft. Add in the tomato paste and stir. Add the Guinness and Worcestershire sauce and stir to combine. Bring to a simmer. Add in the beef stew meat, beef broth, bay leaf and sprigs of Thyme. Cover and let simmer for 2 hours. Remove the bay leaf and sprigs of Thyme. If stew is not thick enough, add in a small amount of the gluten-free flour to help thicken. Add in mushrooms and crumbled bacon. In a small bowl, combine the flour and seasonings for the dumplings. Cut in the palm shortening until mixture is crumbly. Add in cheddar cheese. Slowly stir in coconut milk and mix together until you have a wet dough. Form the dough into small, loose balls and drop them onto the top of the stew. Cover again and cook for another 25 minutes. Once dumplings are firm, remove lid and serve. Oh wow, the stew meat looks fall-apart tender and those dumplings so pillowy soft. What a fantastic meal! Yessss! This is cold weather perfection. I bet this makes the whole house smell divine, too!